We only have one month left until this baby boy gets here so we have started getting everything ready, washing all of the little baby clothes, getting a new car seat, setting up the cradle, etc. 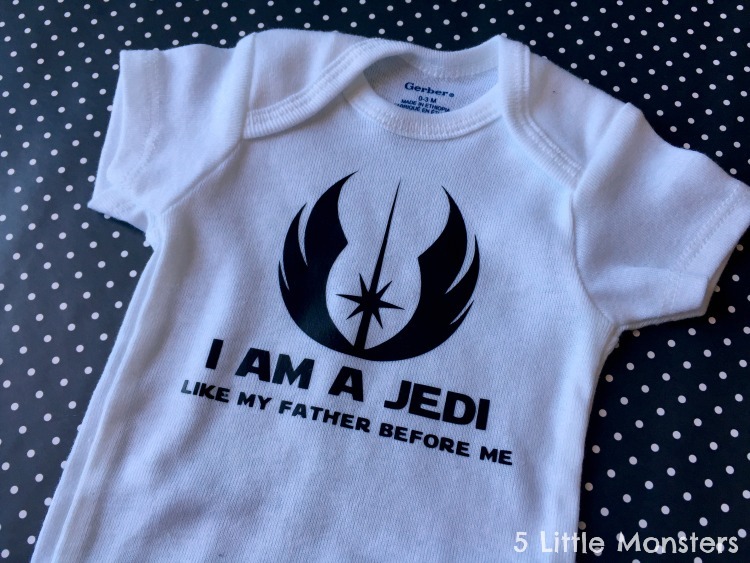 I actually got rid of a lot of our little baby boy clothes a few years ago because I thought that Maren might be our last baby and a lot of the stuff that we have left is not exactly seasonally appropriate. Our other boys were born in January and March, this little guy is coming the end of July. As a result we figured he might be spending the first month or two mostly in onesies. 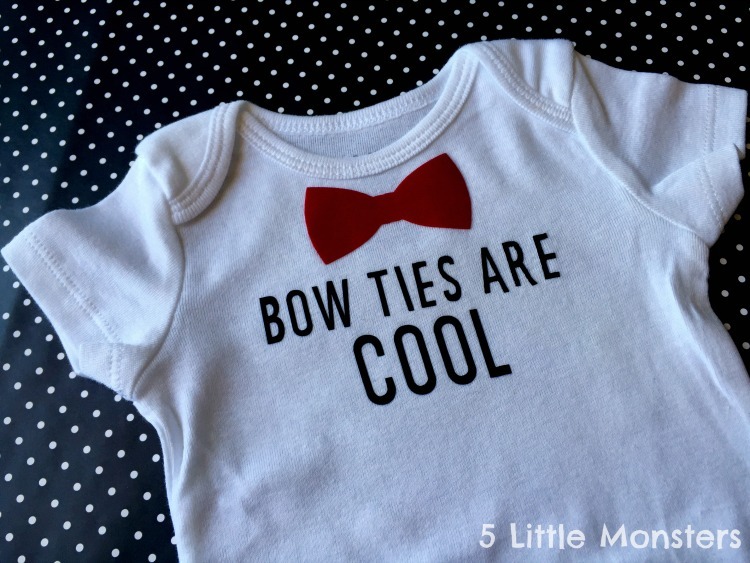 Since I got my Cricut a few months ago I have had fun designing some shirts and onesies, in fact the very first project I made was actually a baby onesie, so we figured it would be fun to design some onesies for the baby. My husband is a huge geek, like he is into most geeky fandoms and even writes a geeky blog. The longer I have been married to him the more I have come to enjoy some of those things myself. I didn't read the Harry Potter books until after we were married and now they are some of my favorites, I enjoy watching shows that I probably never would have watched before marrying Jake like Doctor Who and The Flash. I know more about superheroes, Star Wars, and Star Trek than I ever thought I would. 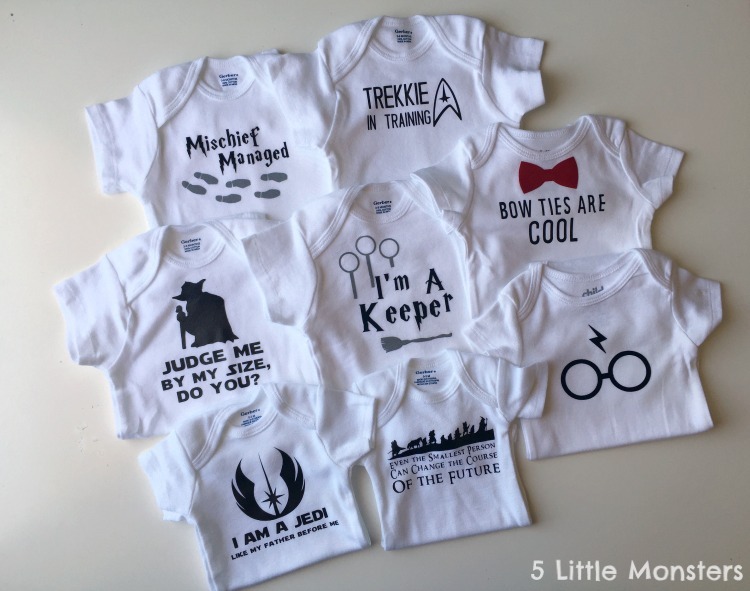 We thought it would be fun to make some onesies that had geeky themes so I designed and made a whole bunch. It was fun to come up with our own unique designs. 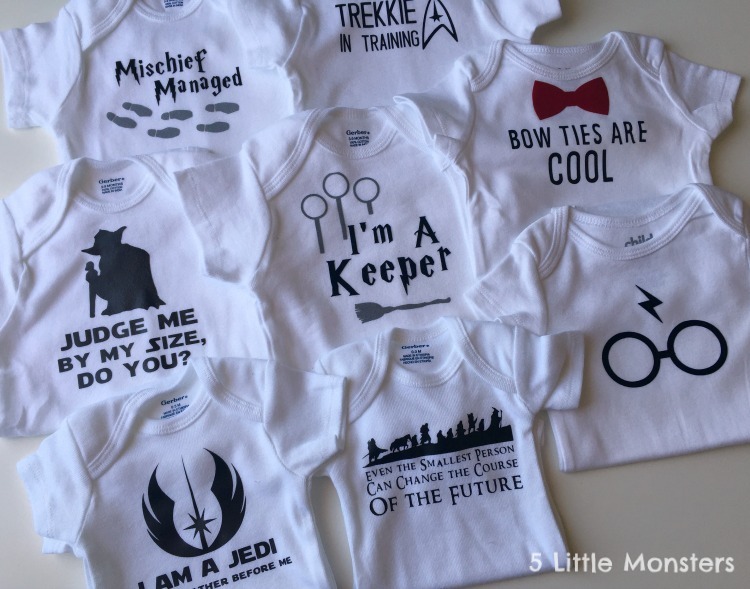 We have some Star Wars, Harry Potter, Doctor Who, Star Trek, and Lord of the Rings designs. 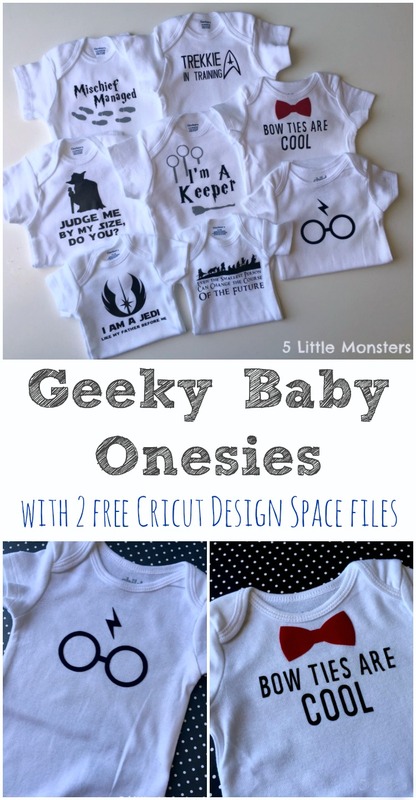 Most of them I can't share the files because most of the images and fonts are for personal use only but I thought I would share them just to give some ideas for some fun geeky onesies. Two of the files I created used only things that were public and I can share those, they are Cricut Design Space files because that is where I designed them and I will link to those two so that you can make your own if you want. I used Cricut Iron on vinyl for all of my designs, both regular and flocked. 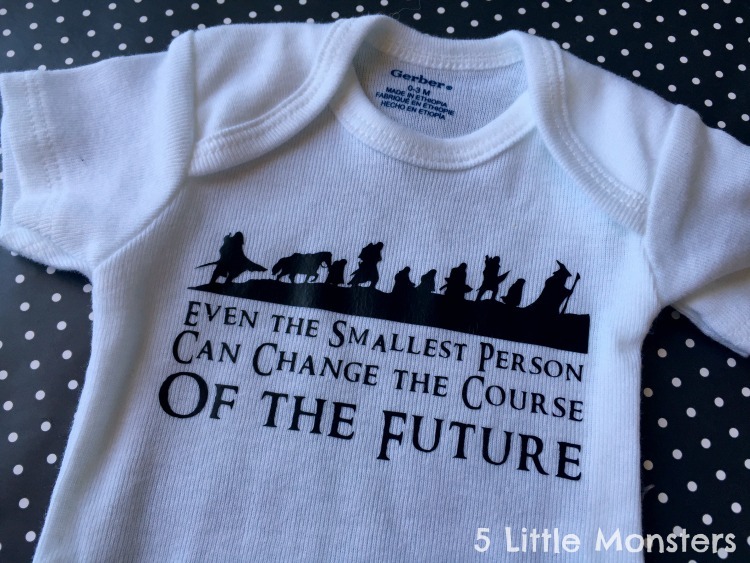 One of the first ones that I made was a Lord of the Rings onesie. My husband found the quote and thought it would be appropriate for a little baby. I really liked the way that it turned out although I will say it was by far the hardest one to cut out because it was the most detailed and the font was probably not the best choice for cutting as small as I did. I almost lost a couple of letters trying to weed it but in the end I was able to get everything on there. 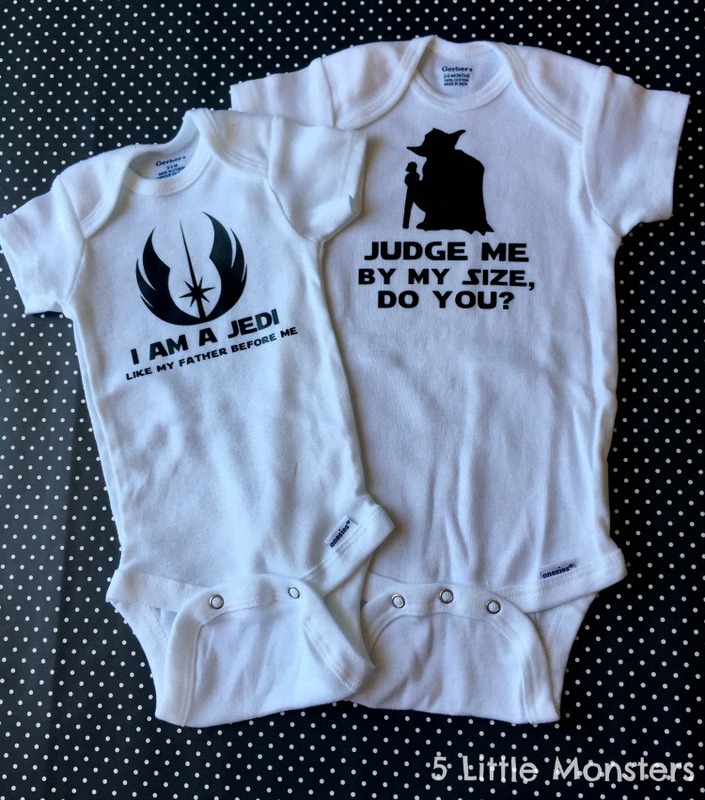 I made two Star Wars themed onesies. The first one I put a Jedi symbol with the words "I am a Jedi like my father before me". 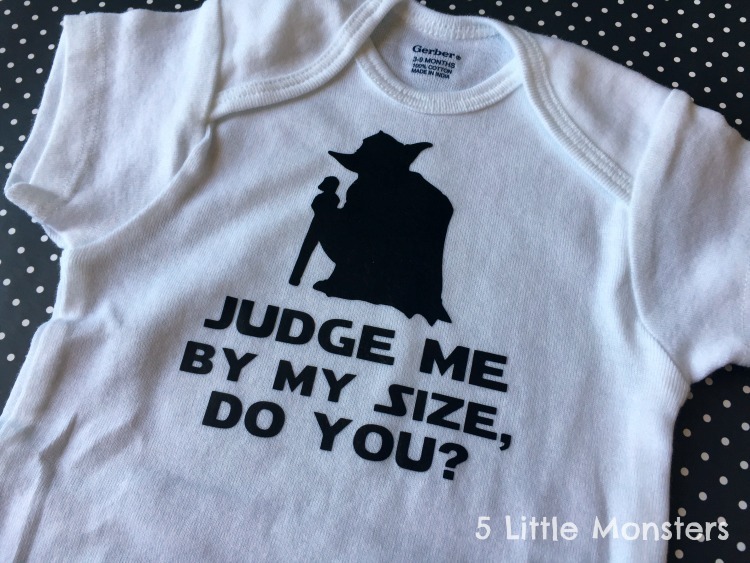 The second I did a silhouette of Yoda with the words "Judge me by my size do you?" This one is one that you see all over but I thought it would be cute and made my own version. I ended up coming up with 3 different Harry Potter themed designs. The first is the glasses a scar. This one I made with images from Design Space so I can share the file for this one. The other two I used words that were written in a font that I downloaded for personal use only so I can't share those ones. The link to the cut file can be found below. 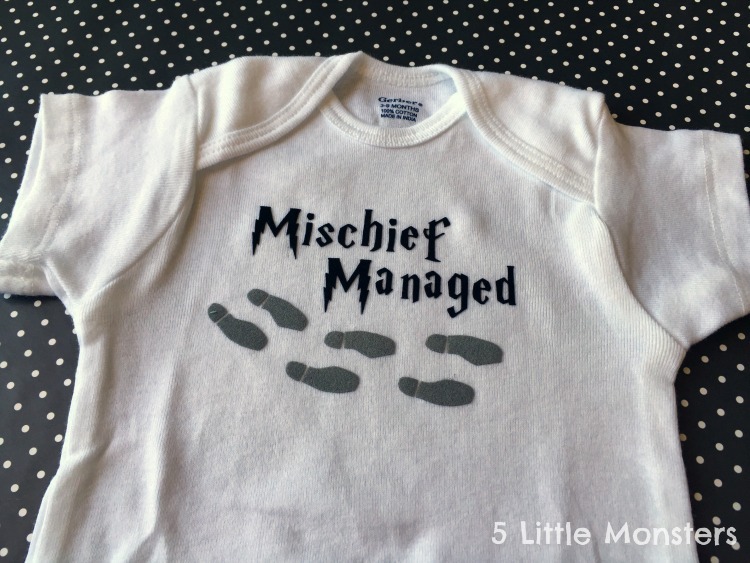 The second one I did was a Marauder's Map onesie with the words Mischief Managed and footprints. I used black flocked iron on for the words and gray flocked iron on for the footprints. This is another one that I have seen several variations of, this was mine. 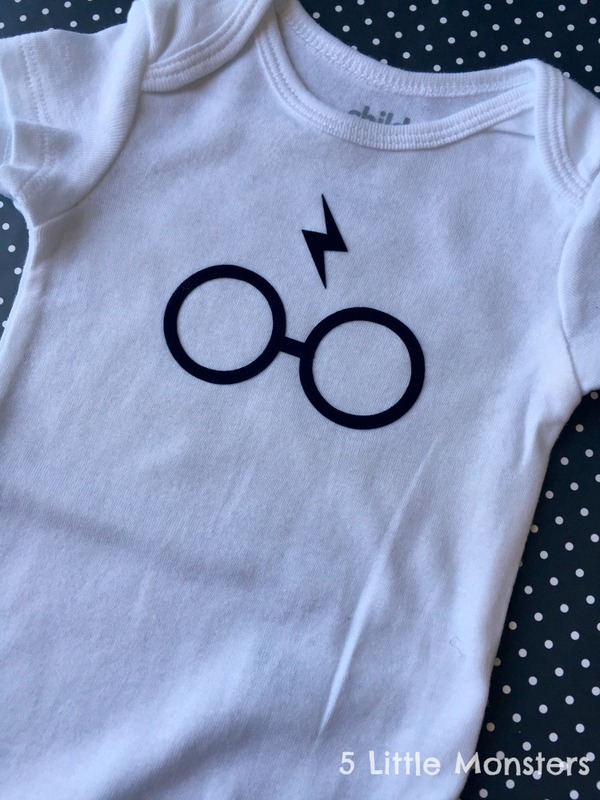 The last Harry Potter one that I made was based on an idea I found by googling Harry Potter onesies and I decided that I had to make it. It says I'm a keeper and it has three hoops and a broom on it. The original one that I saw looked a little different and it only had the three hoops but I thought adding the broom would be kind of fun. I used black and gray flocked on this one as well. I made one Doctor Who themed onesie, based on the 11th Doctor. It has a red bow tie and says Bow Ties are Cool. This is the other that I can share the Design Space file for. The link to the cut file is available in the instructions below. I also made one Star Trek themed onesie. 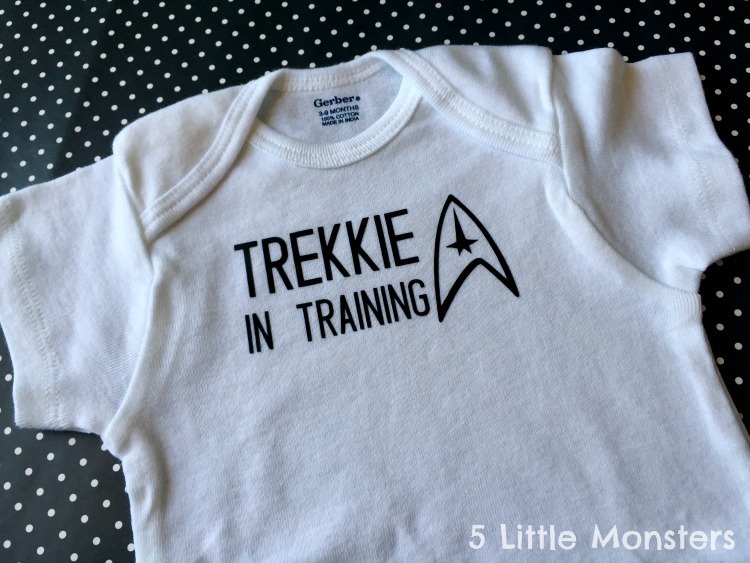 I found a Star Trek symbol and put the words Trekkie in Training next to it. The first thing that I did was search for images online to use for some of symbols and pictures that I wanted, Disclaimer- images are copyrighted so be aware of that when you use images you find online and when deciding how to use them. 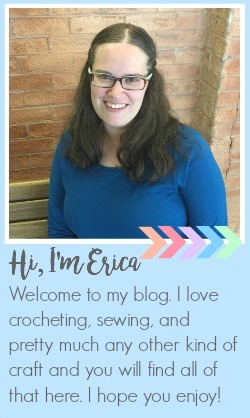 I felt ok about using the images I found to make something for my own personal use but do not feel comfortable either sharing the files or selling items made using those. The same goes for fonts, I used 3 special fonts that I downloaded for free from Dafont.com, Star Wars, Harry P, and Ringbearer, but the free versions are usually for personal use only so if you are wanting to share or sell something you will want to see if there is a license you can purchase or choose a different font. 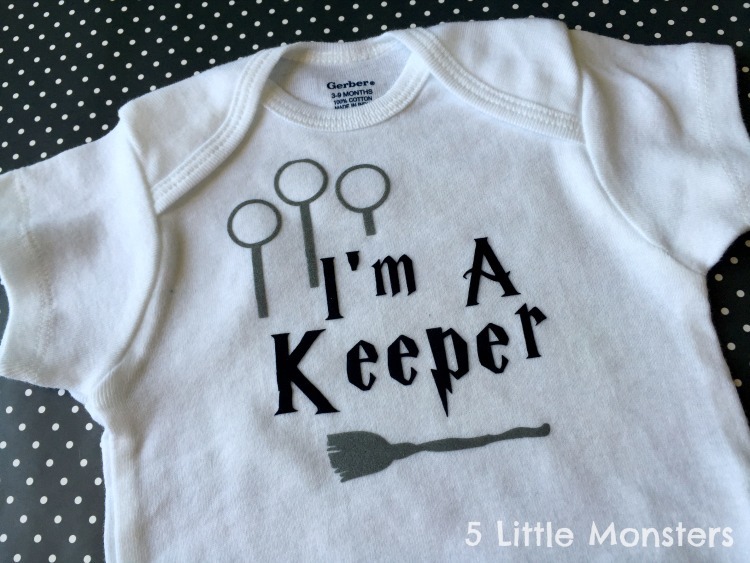 Some of the pictures I created using images I downloaded from design space, for example the footprints on the Mischief Managed onesie, and the hoops and broom on the I'm a Keeper onesie. To create the hoops I combined a couple different images, I started with a ring and then I welded a rectangle or two onto the bottom of it, that way I was able to make the design that I wanted. By playing around with images available through design space and the different tools like slice, weld and attach, sometimes you are able to create exactly what you are looking for. Once I find the images and fonts that I want to use I make sure everything is where I want it to be and the size that I want it. For onesies, at least the small sizes that I was doing, I have found that somewhere right around 4" across is a good size. Some may be slightly bigger or smaller but right around that size is kind of what I aim for. If you wanted to use the design for something else, a bigger t-shirt, a sticker, or whatever else you can think of to use it on, it is easy to resize your cut file to whatever size you need it to be. The next step is to cut it out, just make sure you put your iron on vinyl in with the plastic sheet down on your mat and don't forget to mirror your images. 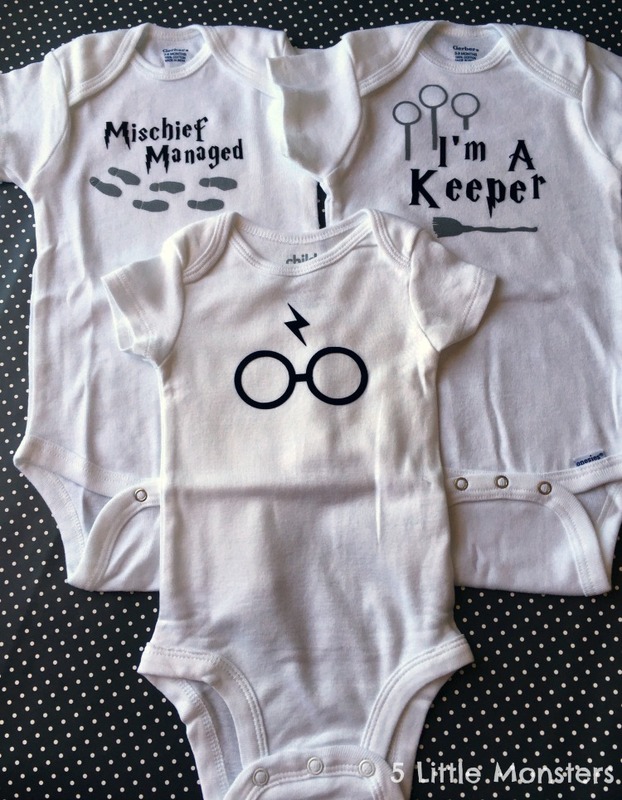 Last all you need to do is iron your designs onto the onesies. Cut out and weed the designs, stick them where you want them to go and press. I like to use a pressing cloth because personally I have had better results that way and I feel like it protects the white onesie just in case there is anything on my iron. Once it is ironed on, peel off the plastic and your onesie is ready to go. I think that onesies have been one of my favorite things to make with my Cricut because they are so quick and easy and you can put pretty much anything you can think of on them. It is fun to try to come up with new design ideas and then just cut it out, iron it on and within minutes be able to see the finished product. Obviously these ones I made for my own baby but they are great for baby gifts as well.